Chain 23, dc in 3rd chain from hook and in each chain across. Chain 3, turn. Skip first dc, dc in each dc across, ch 3, turn. Continue in this manner until you have completed enough rows to make a square or desired size. Ch 1 turn. Sc evenly around cloth and sl st in first sc. Ch 1. Do not turn. Reverse sc in each sc around. Sl st in the beginning reverse sc. End. Work in ends. ** The Nylon Netting I used came on a roll. It is about an inch wide and was sold at most craft stores when I purchased it a few years ago. If you don’t have access to the rolled netting, you can buy netting at any craft/fabric store. 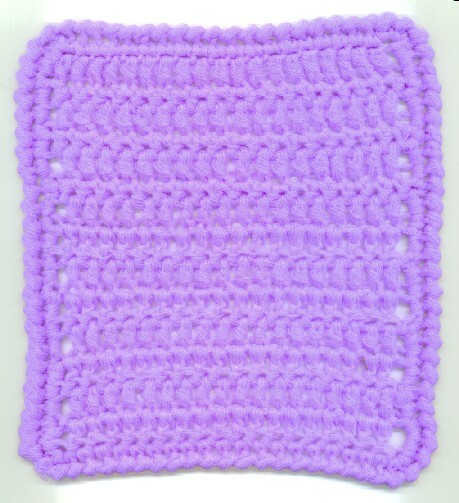 You will need to cut it in desired widths and just overlap when you need to join when crocheting. There are different nettings from a very fine soft, to a coarser/rougher netting. The more coarse, the better, as the coarser netting will clean your dishes better. The rolled netting I have is a softer, and although it works well, I prefer the coarser for cleaning. This pattern was made for your personal use only. Pattern and photos are copyright by Theresa M. Dunlap 2003. Please do not copy and sell this pattern without written permission of the author.